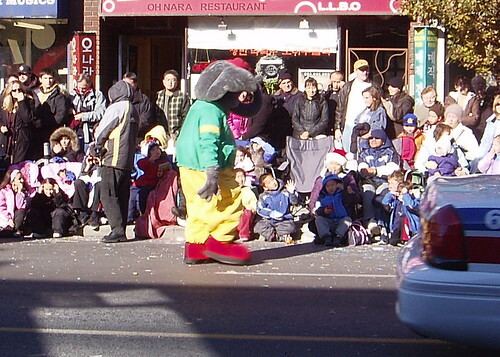 As this year's Santa Claus Parade got rolling, I was happy to see Elmer the Safety Elephant leading the way. Along with Blinky the Police Car, Elmer the Safety Elephant was a character I remember well from my primary school days. He'd pay us a visit and teach us not to run on the streets and important things like that. Elmer the Safety Elephant isn't just marching in parades, he's online. You can even email Elmer at fun@elmer.ca. I might drop him a line to thank him for the bike, train and traffic safety lessons. The Internet saftety tips, however, weren't required. Here's a picture I snapped of the big guy.